We are huge cornbread friends. There isn’t a Thanksgiving that goes by and we don’t have at least one round or square cornbread. 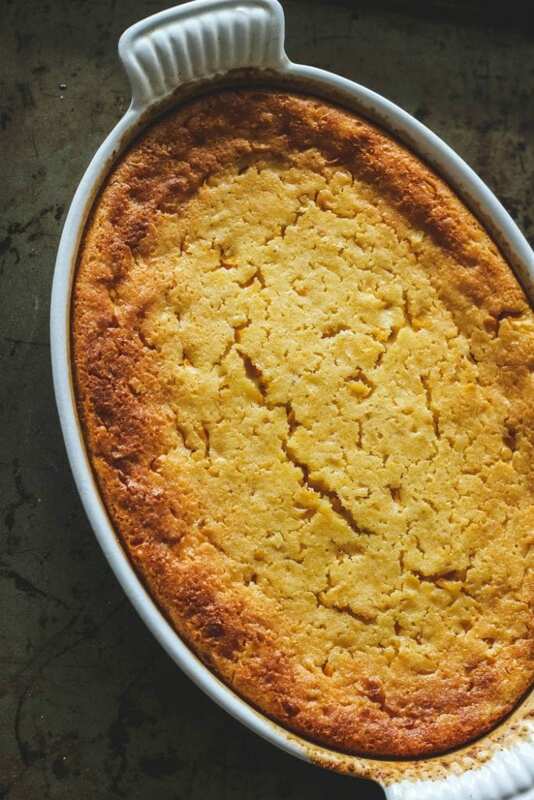 This Sweet Corn Spoonbread will now be at the table with my favorite cornbread. It is so creamy and moist…it could be called irresistible!! What is a spoonbread? While I an not from the Southern part of the States, I have seen my fair share of spoonbreads over the years. The funny thing is, for the last decade or so it has been a part of every one of my Thanksgivings and it was made by Nonna Marta. Nonna Marta is from Bologna Italy. I am pretty sure she did not grow up in the Emilia Romagna region of Italy eat spoonbread, but she may have eaten an equivalent. 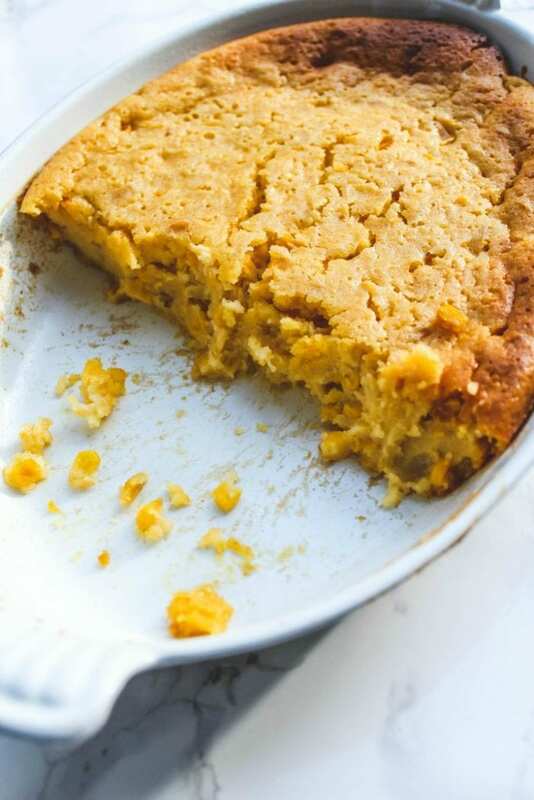 She probably got the recipe from one of her friends when they first moved to the States and her grandchildren have fallen in love with her spoonbread. And so have we!! So here I am, another Italian, tackling a quintessential Southern recipe and also trying to make it dairy free for my dairy free kid. 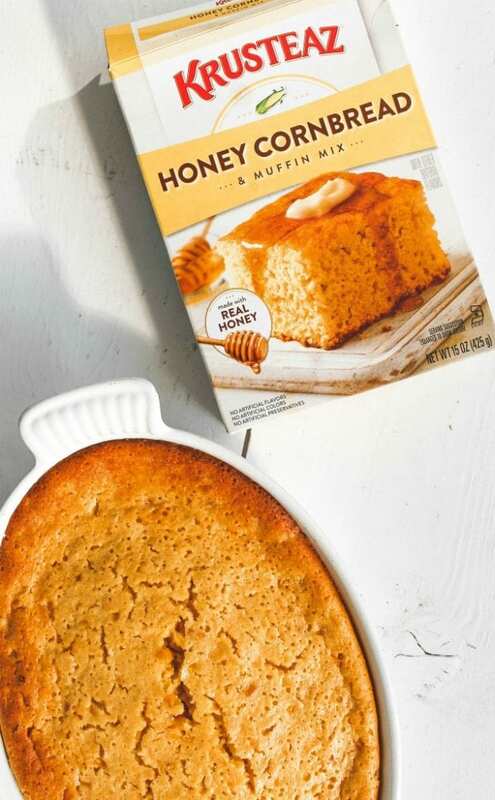 When the lovely people from Krusteaz sent me samples of their Honey Cornbread Mix, I was going to wait for Thanksgiving and make something special that day with it. But knowing how busy I will be baking pies and rolls, I made this last week. I will be making another one of these amazing Sweet Corn Spoonbreads on Thursday! And you should too!! 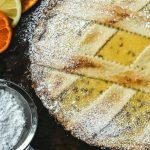 I was going to make it from scratch with my own cornmeal, but my mom said to not mess with this recipe and how it turned out…it is perfect like this! As I mentioned, I was making this dairy free, but you could sub almond milk for whole milk. If you want to make this vegan, use your favorite egg substitute. I used a vegan mayo and a coconut milk yogurt in place of sour cream. I also used a vegan butter substitute (I like Earth Balance), but feel free to use your favorite butter. You may wonder if the cream style corn is actually dairy free. It is! 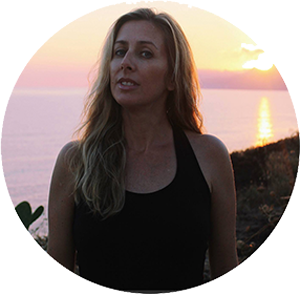 I found a confirmation on this website (great website if you’re looking for vegan recipes or ideas!!). My recipe is a riff on this one from Southern Bite. 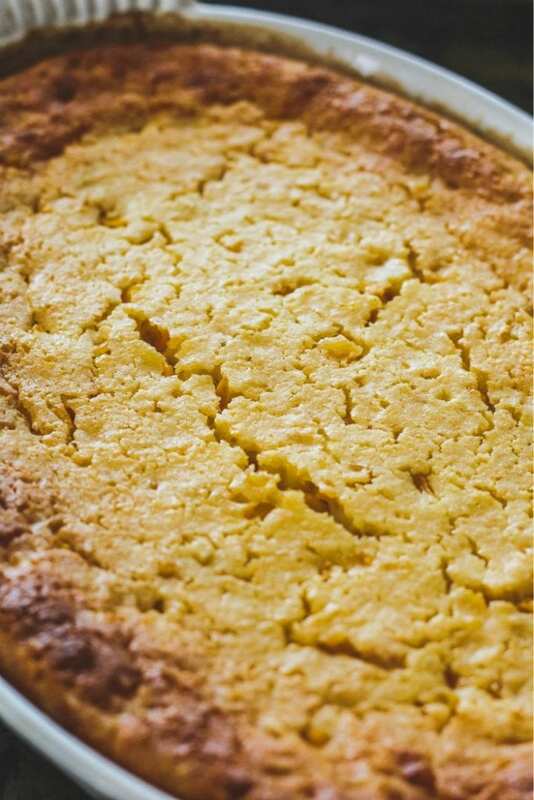 He’s a truly Southern blogger, so I thought I wouldn’t offend my readers from the South with a sweet corn spoonbread. 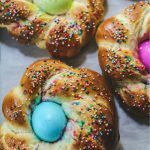 I still think I need to get my hands on Nonna Marta’s recipe. I’m going to call her today and ask her about it. Hers is definitely more pudding like. 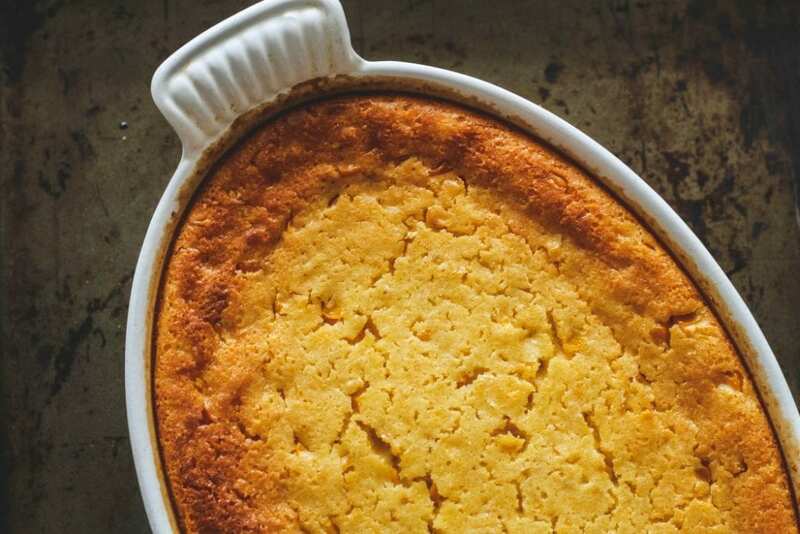 If you’re not from the Southern parts of the States, you may be wondering what is a spoonbread? A spoonbread is not really a “bread”. It is more like a pudding. A wonderful savory pudding that you would eat at your grandmother’s house on a Sunday afternoon. It could be compared to a Yorkshire pudding in consistency and that it is savory. 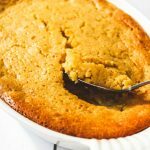 If you are afraid to to make your own sweet corn spoonbread totally from scratch, you should try Krusteaz’ mix. The consistency is perfect. 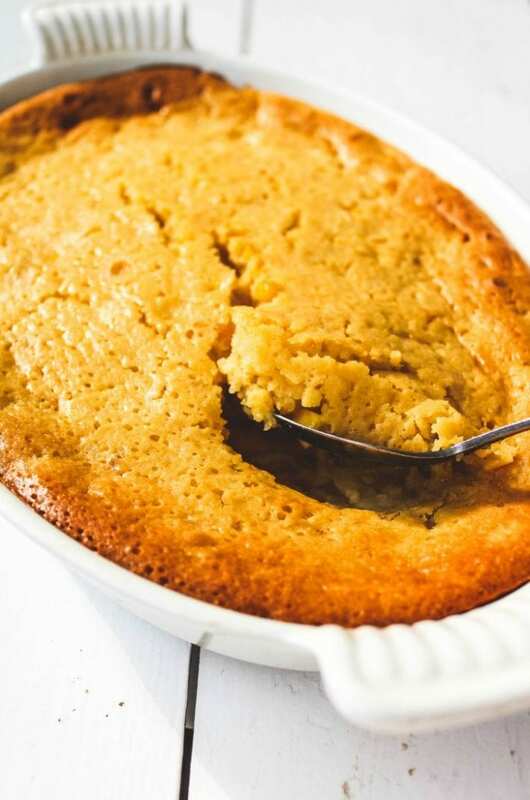 A light sweetness from the honey makes for the most lovely sweet corn spoonbread for your holiday table. I implore you to make this for Thanksgiving. And thank goodness this recipe makes two casseroles, as one will not be enough!! Each time I stopped to adjust the casserole, someone was walking by and stealing another portion of this spoonbread. I’m not even kidding!! Thank you to Krusteaz for providing me with samples of their cornbread and muffin mix to try. All opinions are completely my own. 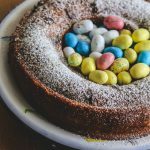 A very easy one-bowl recipe that is comfort in every bite! A delicious and super creamy center that literally melts in your mouth. One casserole is not enough if you're making for a party! 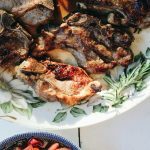 This recipe yields 2 casseroles. Preheat the oven to 375° and lightly grease a 2-quart casserole dish (I made two 2-quart portions) with nonstick cooking spray. In a large bowl, combine the mayonnaise, yogurt, melted margarine, eggs, sugar and salt. 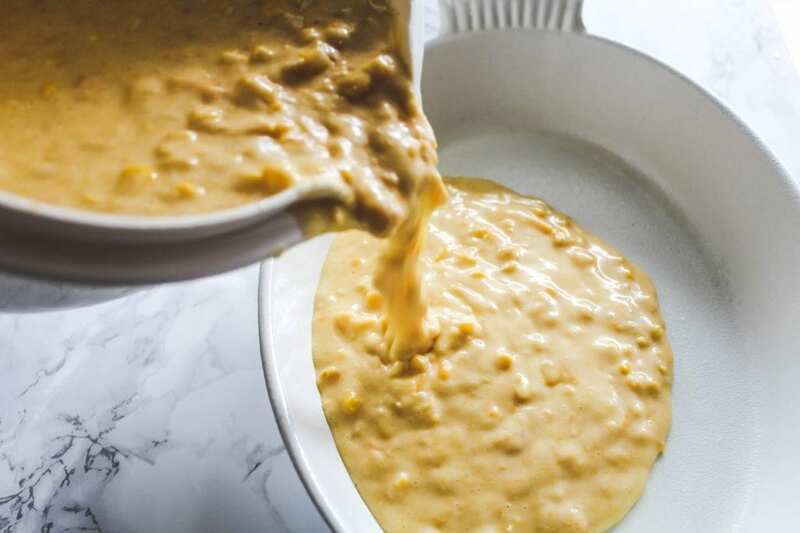 Stir in the cream style and whole corn. Fold in the Krusteaz Honey Cornbread mix. Pour the mixture into the prepared casserole dish. Place into the oven and bake until golden brown and set, about 30-35 minutes.